Well I'm two posts in after an almost 3 year hiatus and I feel like time has stood still. 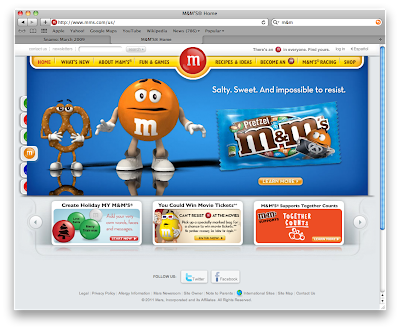 Unlike the Snickers.com site, which feels like a one-shot site that's overstayed it's welcome, the M&M site has a polished structure that lends itself to longevity. However Snickers has new content, whereas the M&M site just has new promotions (expected). This site is a great example of elegant interactivity, it's full of little bits of fun just like the candy itself. Not to sound too much like a geek who's done this for years, but little things like the way they handle the masthead navigation on the left is pretty sweet. And even the roll overs on the bottom promotional tile arrows have the extra bit of love that makes you want to click again. I enjoyed poking around the site the last time I looked at it, and I'm a little disappointed that there's no new content. 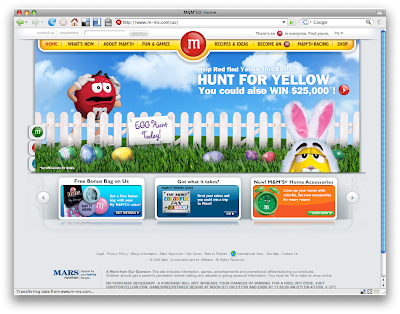 They still have the same "create an M&M avatar" app, granted it's got a few more cosmetic options but it's still an isolated site app. It's cool that you can make an avatar and then go play their games with that avatar...but I'm surprised the app hasn't made it's way to Facebook, Itunes, Android etc. Creating an M&M avatar army in the social space would be interesting..especially since they too are rocking 2 million + likes.